Merchant ships do not devote this much space to a gundeck, only a warship, or a pirate, would find this a valuable use of hull space. 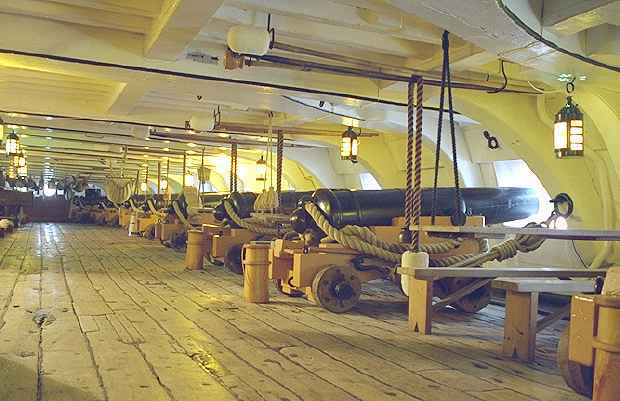 This is a gundeck on a British Man o War. Note the tables that are set up between the guns. This is where the crew ate and slept. The tables were removed when action was imminent. There were a variety of shot types employed in guns at this time. Round, Bar, Chain, Grape and Sangrenel. Round shot gave the best range and penetration when it came to damaging an enemies hull or a fortification. 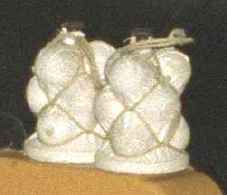 Bar shot, two balls, sometimes two halves of one cannonball, linked together by a solid bar, was used to damage masts and rigging. It tended to tumble when fired and its accuracy was at best unpredictable. There are several sub varieties of bar shot, Linked Bar shot and Expanding Bar shot. They all have similar function and design. Linked (Jointed) Bar Shot has the two halves of a single cannonball attached to a bar that is hinged in the center. When closed the halves form a single ball for easy loading. When fired the bar swings open, creating a much longer bar shot with an increased chance of damaging rigging. Expanding (Sliding) Bar Shot usually has two cannonballs, or two halves, each with an attached bar. Instead of the free end being attached to a second cannonball, it is looped around another bar. This loop can travel along the other bar in either direction, until it meets the cannonball at one end or the other bar’s loop. It is loaded ‘closed’ and once fired it opens up to increase striking area. Another shot load used by gunners, and also referred to as ‘bar shot’ consists of several short lengths of iron bar that are bundled together with a length of rope wound around them to hold the bars together. The bundle’s size is determined by the bore of the gun it will be loaded into. When the gun is fired the rope burns away and unwinds, allowing the cluster of tumbling iron bars to open up into a wider spread. It is particularly effective when used against massed troops. Chain shot consists of two balls, or two half balls, connected by a length of chain. This load was primarily intended to damage rigging. 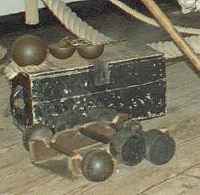 Grape shot consisted of tightly packed bundles of musket balls and are designed to clear a deck of defenders. Double Shot consists of two round cannon balls loaded in one cannon and fired at the same time. This reduces the effective range of the cannon, but can be devastating within pistol shot range. Sangrenel is basically a bag of jagged scrap iron, nails, bits of chain and similar waster. The bag disintegrate in the barrel and the contents sprayed out in a deadly cloud.. The resulting wounds are hideous. Guns are identified by their pound rating; in other words the weight of a single solid iron shot fired by that bore of cannon. Common types were 42-pounders, 32-pounders, 24-pounders, 18-pounders, 12-pounders, 9-pounders, 8-pounders, 6-pounders, and various smaller calibres. Additionally there were a variety of names applied to the different types and sizes of guns. A falconet is a gun of fairly light construction which fires 1-pound solid round shot projectiles. Used for the defence of light vessels, on small boats and for boarding maneuvers. It can also fire grapeshot. 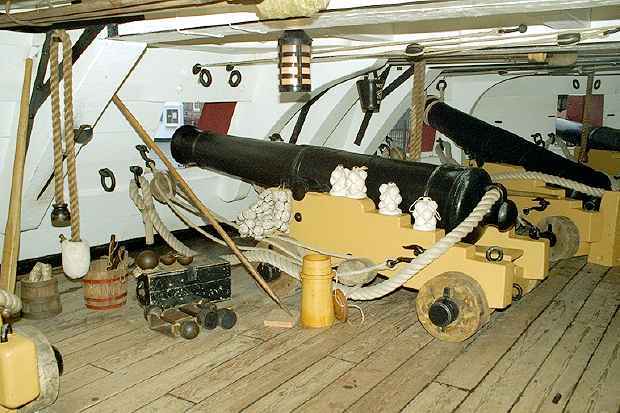 The Long Nine is a longer barrelled 9-pounder gun that is mounted as a bow or stern chaser, where it is not perpendicular to the keel and had the room to load and operate. In a chase situation, the gun’s greater range came into play. The need to reduce the weight at the ends of the ship and the fragility of the bow and stern portions of the hull, prevented 12 or 24 pounder guns from being used.